How Does Davos Man Use History to Make Sense of New Technologies? The World Economic Forum is currently underway in Davos. The great and the good are gathered there to discuss the future of the world economy. The term Davos Man is often applied to the elites who gather there. I’ve used that moniker in the title of this blog post, even though I know it is somewhat misleading because it suggests a degree of cognitive uniformity among the very heterogeneous group of individuals at Davos. There does appear to be a herd mentality and an element of group think at this event. The theme of this year’s WEF is technology, specifically, the “Fourth Industrial Revolution.” This label is being applied to a grab bag of technologies that includes Big Data, 3D printers, advances in biotechnology, and self-driving cars. Whether the term Fourth Industrial Revolution makes any sense is an issue I will leave to another blog post. The crucial thing for our purposes it that the concept has caught on life wildfire. It is interesting that Professor Klaus Schwab and the other Davos organizers have chosen a title for this year’s gathering that is so rich in historical significance: the term Fourth Industrial Revolution evokes previous Industrial Revolutions which, as every schoolchild knows, has massive economic, social, and political consequences. James Watt is getting a lot of publicity this week. Why have so many people picked up on this concept of the Fourth Industrial Revolution? Why are so many journalists, policymakers, and businesspeople trying to use analogies with past Industrial Revolutions to try to predict the future? We are all familiar with the fact that investment prospectuses say, past performance is no guarantee of future results. We all know that history doesn’t repeat itself although sometimes it rhymes. However, in moments of radical uncertainty, we tend to gravitate to the past as a sensemaking tool. Whether it is a good analytical device is a separate issue. Individuals frequently employ historical-analogic reasoning and historical periodization to make sense of the unfamiliar. The trajectory of change in industries characterized by incremental innovation is relatively easy to predict. In contrast, radically disruptive technologies are an important source of uncertainty for economic actors ( see the academic research by Sainio, Ritala, & Hurmelinna-Laukkanen, 2012; Petrakis, Kostis, & Kafka, 2015). 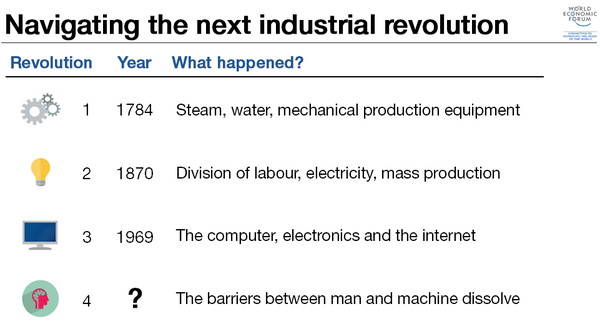 It is not, therefore, surprising to see observers, particularly journalists, economists, and CEOs who necessarily lack detailed specialist knowledge of the specifics of the “Fourth Industrial Revolution” technologies, gravitate towards historical analogies as a sensemaking tool. If you are interested in the more general issue of how ideas about history shape the strategies of economic actors, my recent article, which was co-authored with Jason Russell, can serve as a gateway in the literature. Update: To date, none of the economic historians in the academic blogosphere have ventured any comments about whether the concept of the Fourth Industrial Revolution is valid or simply a marketing gimmick. Seems like a wasted opportunity/teachable moment. Petrakis, P. E., Kostis, P. C., & Kafka, K. I. (2015). Secular stagnation, faltering innovation, and high uncertainty: New-era entrepreneurship appraisal using knowledge-based thinking. Journal of Business Research. Hill, R. C., & Levenhagen, M. (1995). Metaphors and mental models: Sensemaking and sensegiving in innovative and entrepreneurial activities.Journal of Management, 21(6), 1057-1074. Sainio, L. M., Ritala, P., & Hurmelinna-Laukkanen, P. (2012). Constituents of radical innovation—exploring the role of strategic orientations and market uncertainty. Technovation, 32(11), 591-599.